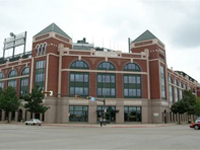 Arlington Trolley Gets You to Globe Life Park Fast and Easy! Once you book your ticket online, you will receive an email with your ticket attached. Please print this and present to your hotel front desk staff for verification that you are a guest in the hotel. Once verified, they will stamp your ticket. You will present this stamped ticket the Trolley driver for departure to Globe Life Park. You will also need to present this same ticket for your return trip to the hotel.